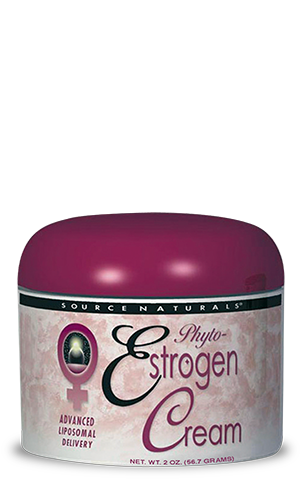 Source Naturals' progesterone cream is one of our top products, attracting thousands of loyal customers over the years. This liposomal-base, phyto-oestrogen cream addresses the second essential hormonal need of peri-and post-menopausal women. It contains the finest phyto-oestrogens, in the right amounts and in a standardised form. Each ounce (28 g) of cream contains 60 mg soy isoflavones and 100 mg red clover extract, as well as the herbs Cimifuga racemosa (Black cohosh) and Dong Quai (Angelica sinensis). It's also the first cream to contain pomegranate juice extract, a natural source of oestrone. The liposomal delivery system is ideal for this product, ensuring the best possible absorption. Purified water; liposomal soy isoflavone extract; lecithin phospholipid; aloe vera leaf gel; caprylic/capric triglyceride (emollient) and glyceryl stearate (emulsifier); glycerin; cetearyl alcohol and ceteareth-20 (emulsifiers); cetyl alcohol (emollient); stearic acid; tocopheryl acetate (natural vitamin E); cocoa seed butter; phenoxyethanol (preservative); pomegranate seed juice extract; red clover flowering tops extract; black cohosh root extract; dong quai root extract; grapefruit seed extract; dowicil and sorbic acid (preservatives); xanthan gum; rosemary oil and natural cherry-almond fragrance. Warning: Contains peanuts and soy.